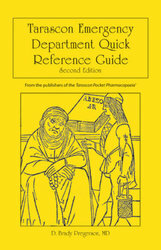 Tarascon Emergency Department Quick Reference Guide, Second Edition is a concise and easy-to-use reference book filled with essential resources for physicians, nurses, and EMTs working in an emergency setting. Numerous tables, lists, and figures allow for quick and easy retrieval of vital information. The Second Edition features a a new section on empiric antibiotics. This essential resource also includes sections on physical exam diagnostic tests, procedures and sedation, diagnoses, risk management, med-legal and billing, practical advice, and much more. Dr. D. Brady Pregerson is a full-time emergency physician and part time author who focuses his writing efforts on emergency medicine topics with an emphasis on patient safety and illness & injury prevention. His titles include the Tarascon Emergency Department Reference Guide, Quick Essentials Emergency Medicine, The A to Z Pocket Pharmacopoeia, Don't Try This at Home, and Think Twice: More Lessons from the ER. Dr. Pregerson graduated for the University of California, San Diego Medical School and completed his Emergency Medicine residency at Los Angeles County University of Southern California General Hospital. He has served with the United States Peace Corps in Swaziland, Africa as a science and math teacher. He also manages EMresource.org, a web-site that offers medical references and free educational resource material for emergency health care providers. He continues to have a strong interest in education, and gives medical lectures four to five times a year.